Personal email signatures - should you use one? 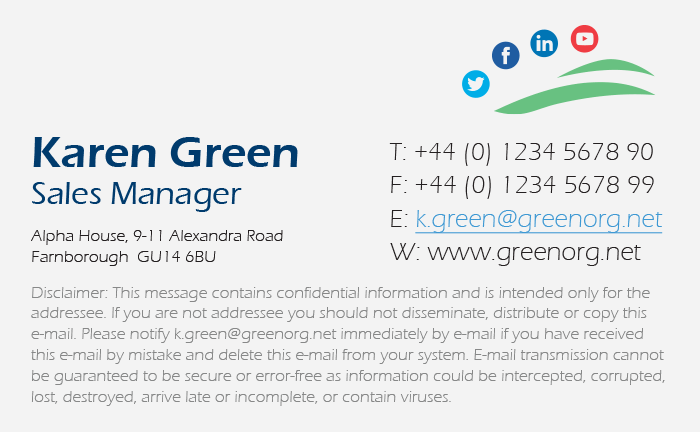 You should think of a professional email signature as an electronic, 21st-century business card. First and foremost, it tells people who they’re dealing with. At its most basic, a professional email signature used by an employee includes personal information such as their full name, job title, phone number and email address. However, you can take things further and transform a basic email signature into a marketing communications channel by including a company logo, brand elements, promotional banners and social media links. The employee’s first (given) name and surname. You’d be surprised how many people think just having “Bob” as their contact name is acceptable. In fact, over 30% of signatures don’t even include a name, which doesn’t re􀃢ect well on your organization. Job title. This lets recipients know what type of person they are dealing with. They may rely upon your job titles to understand the structure of your organization and the way it operates. Company name. Having your company name in your signature is a no-brainer. 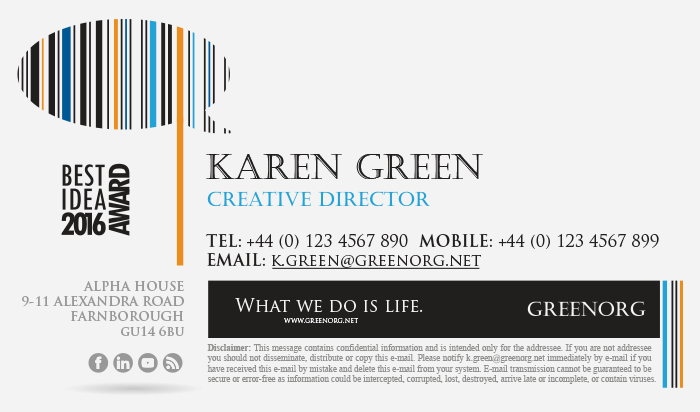 This can be done using just plain-text, but we would advocate using your corporate logo instead. Telephone number. This should be the main number that the employee can be reached on, be it a landline or business mobile. It is also common practice to include a country prefix if your organization deals internationally or has offices in other geographic regions. For example, a UK number would have +44 at the start, so it would appear as +44 (0)1234 567890. Email address. Don’t let people tell you that adding an email address to a signature is pointless. It’s true that recipients can press ‘Reply’ to answer your message, but some email clients like Outlook use Display names rather than email addresses in the ‘From:’ field. This means that if your email is forwarded, only the Display Name will appear, which makes it difficult to reply. Adding an email address saves time for everyone in the long run. Learn more. Website. Adding a link to your company’s website is a great way to get additional online traffic, especially considering how many emails your organization sends a day. Learn more. Email disclaimer. In order to ensure your organization complies with various global regulations, it is often required that you include an email disclaimer in your signature. Whether you agree with this or not, it is still the law in many countries to include one. This will also often include your registered company address. Learn more. The following are elements that we recommend you include in your corporate signature. More and more organizations understand the importance of email signatures, so having these items will really help convey the professionalism of your brand. Company logo. Do your business cards, headed paper, compliment slips, product packaging, invoices, signage and online presence conform to your brand guidelines? Of course they do. So why shouldn’t you treat your email signature in the same way? It’s vital to consider email as unique and worthy of specific attention as any other branded element you use. Learn more. Social media links. Use email signatures to promote your social presence and your very latest content to the people with the highest chance of connecting with it – the people who read your corporate emails. Learn more. Promotional banners/advertising. Include signature banners in your emails to promote products, services and events at the right time and to the right people. Also, if you’ve won an award, be sure to let everyone know about it in your signature. Learn more. Photo image. The popularity of personal photos on social media sites, including the business-focused LinkedIn, suggests there is value in putting a face to written communication. How much it appeals probably depends upon your corporate culture and industry. Learn more. Also, remember to optimize your signature for mobile devices. Over 50% of all emails are now read on a smartphone or tablet, so you could run the risk of alienating more than half of your audience if you have a poor signature presented to the mobile market. So, you now understand what should go into your corporate email signature. Now, it’s time to stand building one. Follow our step-by-step guides below and you’ll have a fantastic new signature in no time. 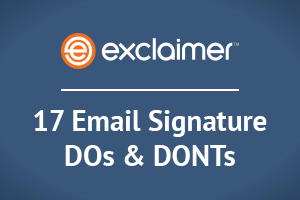 For other hints and tips on creating a professional email signature, read our 17 Email Signature DOs and DON’Ts. Be aware that you can’t achieve professional email signatures for all users if you can’t control them. From bungled spellings to a banner for a sale that’s long since ended, if one team doesn’t have overall control, email signature management can become a nightmare. Once you’ve lost control, you will inevitably incur costs in some way.